Training your pig is a must. 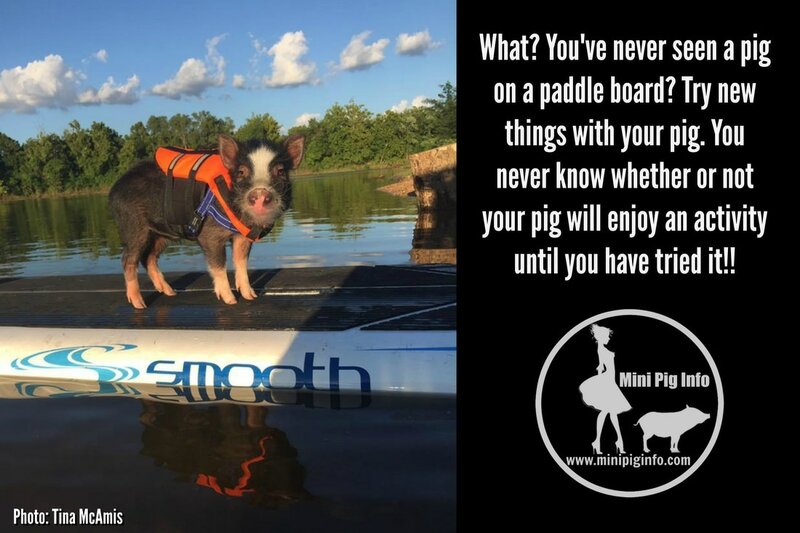 We have several pages that discuss various aspects of training such as harness training, teaching your pig tricks, general training as well as dedicated pages that can help you with aggressive pigs, spoiled pigs and hard headed pigs. The training section has been moved to "declutter" the pages and make information easier to find on the website, so please click here for the first page of the training section. 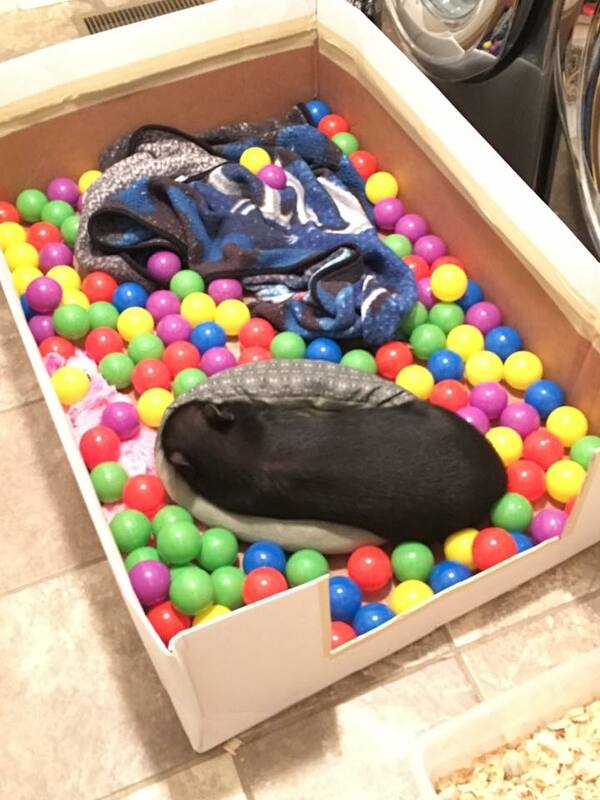 There are many ways to keep a pet pig entertained. Despite what some people might believe about pigs being slothful and lazy, in fact a happy pig that is not depressed, is very energetic, and loves to play. There are actually many dog toys that you can get that would entertain a piggy. 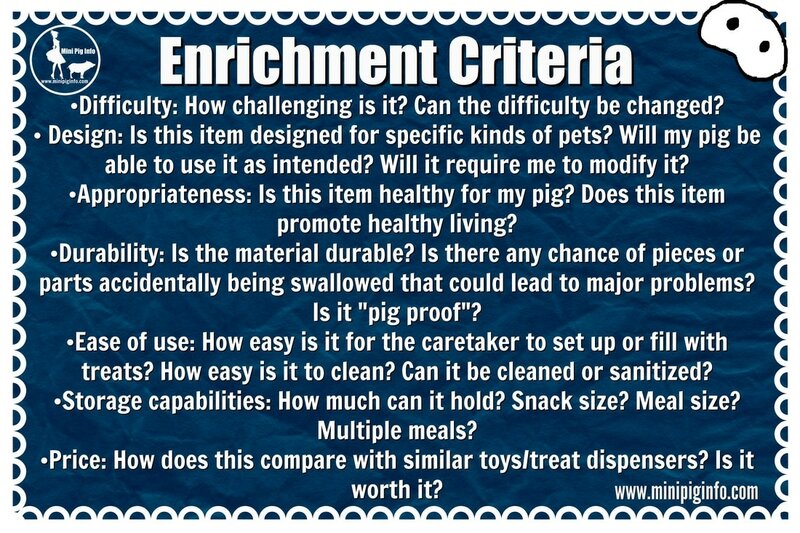 Please read our blog regarding specific enrichment activities for your pig by clicking here, and/or read below for additional enrichment ideas!! For instance, the Kong toy is a great choice. You can stick peanut butter into the center and then let your pig roll it around as it licks peanut butter out of it. Any rope toys designed for dogs are also good for a pig. Big basketballs or anything large enough for your pig to roll around with its snout will probably be enjoyed. There are sticks of seeds and alfalfa you can buy and give to your pig for some entertaining snacking. You can even cut up an apple into pieces small enough to fall out of a treat dispensing ball of some kind and watch your pig chase that for hours! Keeping a pig entertained does wonders for your pig. It allows the pig an opportunity to exercise and promotes a good healthy lifestyle. This can be a special time for you and your pig to spend time together and play. There are many ways to keep your pig entertained and occupied. Just keep in mind that this does not mean that you can leave your pig to its' own devices for long or extended periods. Your pig needs your love and attention just like any other pet. Pigs aren't meant to stay in crates for 12 hours a day, nor are they meant to be lawn ornaments. 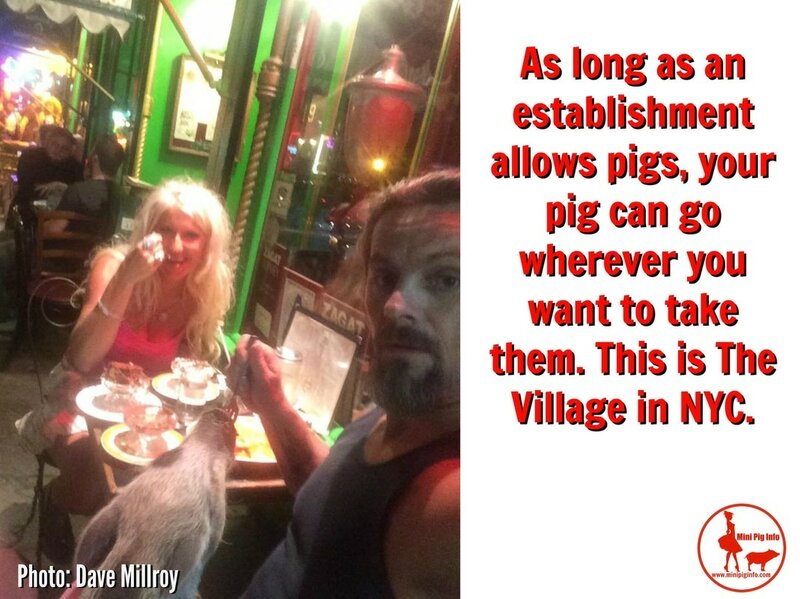 Pigs need social interaction and training. A untrained pig can be unruly, ill-mannered, and not a pleasant pet to be around. 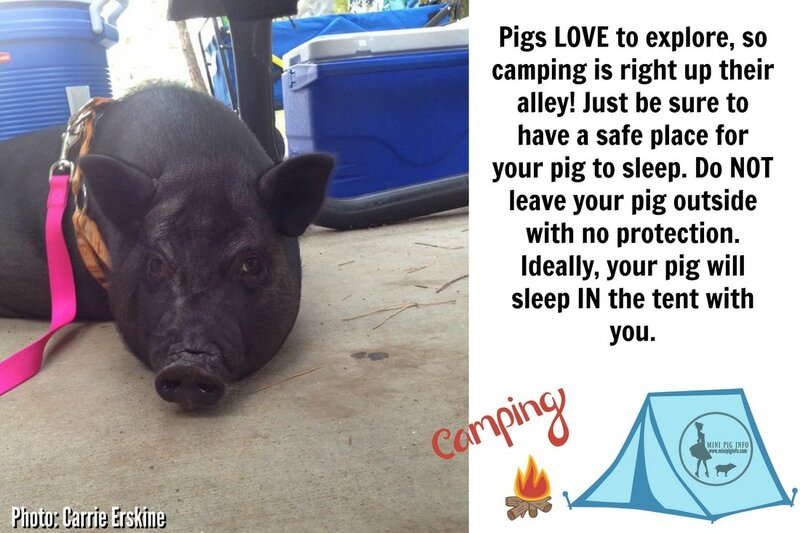 Pigs NEED outdoor time, this isn't a matter of whether or not a pig needs to go outdoors, but a statement letting you know pigs need to have access to a yard or outdoors. Not only does the natural sunlight aid in the absorption of essential vitamins and minerals, but it also allows them to be a pig. Pigs love to dig, by providing them with a place outdoors to satisfy this craving, you have essentially helped them to discover new things and fill that void to root and also help with bored pig syndrome. Please use pig appropriate treats. Also NEVER EVER give your pig chew toys made from pork or pork skin! Do not give it toys that can be easily chewed apart or may be easily swallowed. Do not give it toys that are made from foreign substances like plastics or rubber that can be chewed apart. NO BONES WHATSOEVER! If your pig manages to chew some rubber, bone or plastic it can stick in its intestines and cause an impaction which can be deadly or cause microscopic tears in the esophagus, stomach or intestines that can lead to many other medical complications. Play time with your pig can be a wonderful bonding time and get your pig some valuable exercise and companionship. Pigs need to have their human parents and/or toys and play time. Pay attention to your pig and you will hopefully be rewarded with a long-lived, happy, and healthy piggy friend. The main goal of enrichment should be to enhance your pigs’ environment to provide both mental and physical stimulation through the use of novel stimuli. Make sure to get your pig on the move every day. The more exercise your pig gets, the less likely you will have to deal with weight issues or destruction of your house and yard. You should train your pig and work with your pig on a daily basis. You can use a combination of positive reinforcement training techniques to help your pig(s). Most of the pigs will sit for treats or sometimes even medication. Some pigs will sit and even shake his hoof for a tiny morsel of a treat such as our dehydrated fruits or vegetables. 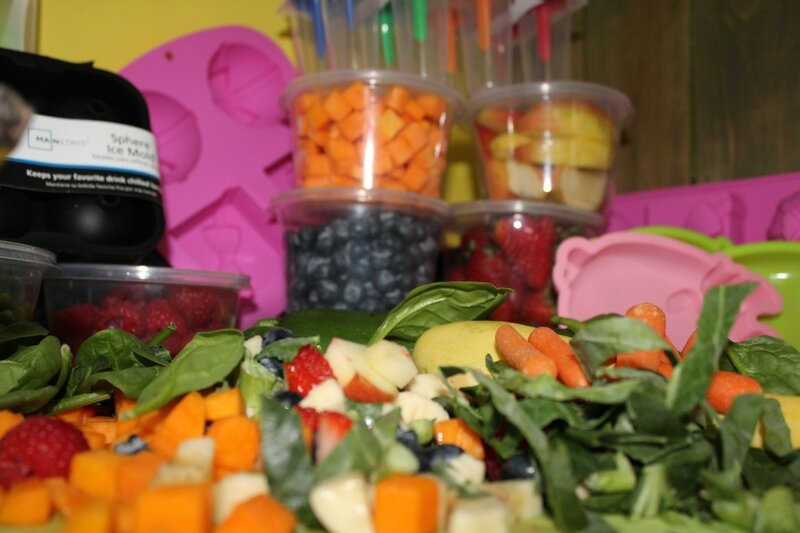 But remember fruits have a lot of sugar so use them sparingly. There is nothing wrong with positive reinforcement and the use of treats, but, one Cheerio can be divided into 4 treats. Most of us, (including myself), are guilty of overindulging our pigs and giving them way too many treats. 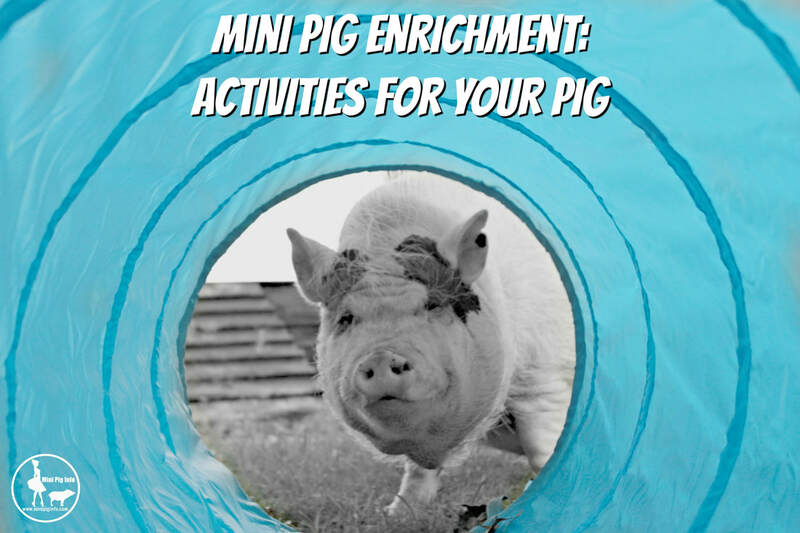 The goal of enrichment should be to promote a stimulating environment for your potbelly pig. In general, I have found it works well to prepare one enrichment item per pig per day. This is not always possible, and even if enrichment is provided every three days or once a week, it will still help to enhance your potbelly pigs’ wellbeing. Pigs are incredibly intelligent and curious, and benefit greatly from a regular enrichment schedule. Find what works for you and your pig, and be prepared to stick with it. In general, when putting out enrichment items, it is important to only place them in the environment for a set amount of time and then REMOVE them, as many items loose their novelty if left in the environment. I generally leave the items out for up to one day. In addition, try to create enough enrichment items to where you can place them out on a rotating schedule. 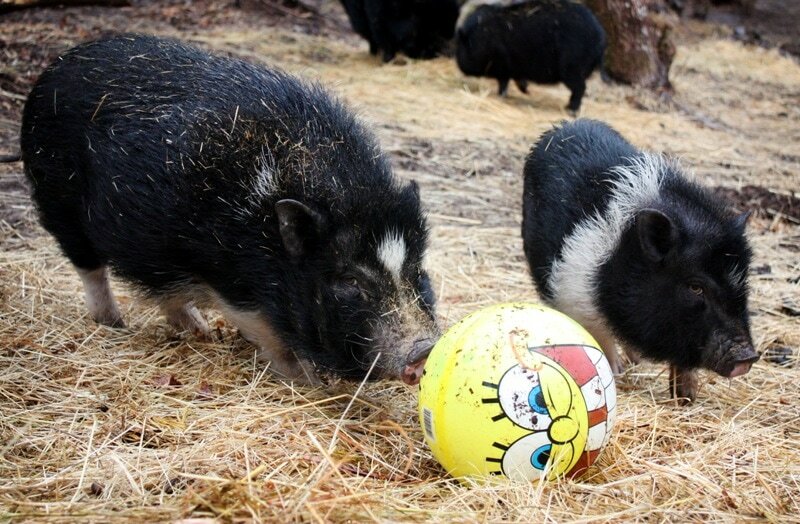 Enrichment items that are used too often will also loose some of their novelty for the pigs. Variety is key to creating a proper enrichment program. It is important to consider the pig’s natural history when designing enrichment items. Pigs are natural foragers and rooters, spending a majority of their time in the wild searching for their food. By providing enrichment, you should be promoting the use of your potbellies’ natural abilities. When you first introduce a new item to your pig, your pig may choose to ignore it or may choose to investigate it thoroughly. Even if your pig completely ignores an item, don’t immediately make the decision to discontinue using that particular item. Try putting it out several more times, and you might find your pig eventually decides that he or she likes that item. Even if they don’t seem to particularly enjoy an item or only spend a small amount of time interacting with it, I would still continue to use that item occasionally. Remember that any change to the environment that allows your pig to make behavioral choices (either investigating or ignoring an item) have served the intended purpose of enrichment. The most important goal of enrichment should always be to enhance the wellbeing of your pigs. Enrichment should not been seen as method to stop your pig from doing other undesirable, yet NORMAL behaviors. Rooting is a behavior exhibited by potbellies that is often described as an unwanted behavior done only by pigs that become bored in their environments. This is absolutely untrue and does an incredible disservice to pigs. Rooting is a NORMAL, HEALTHY behavior for pigs. Please do not expect the implementation of an enrichment program to stop your pig from exhibiting this normal behavior. Your pig should always have access to root, and this too can be considered a form of enrichment. 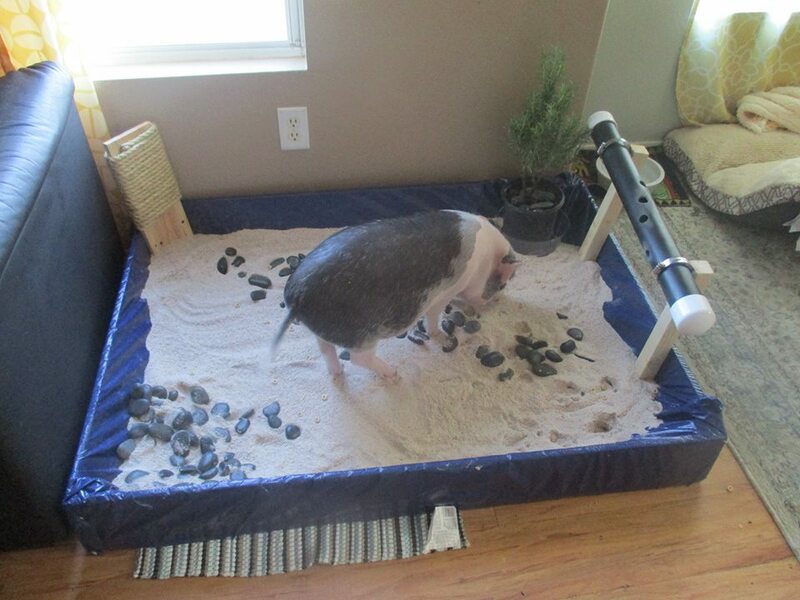 Enrichment CAN however, help stave off UNhealthy behaviors that are not normal and are exhibited by pigs out of boredom in a stale environment. It is important though to realize that the best way to deal with unhealthy behaviors is to PREVENT them from happening in the first place. Begin an enrichment program with your pig as soon as you acquire him or her and BEFORE your pig starts exhibiting unhealthy behaviors. Remember, the goal of enrichment is to enhance the well being of your PIG. Please do not ignore the needs of your pig and wait until your pig has developed unhealthy behaviors before deciding to implement an enrichment program. There are virtually no limits on how many different enrichment items you can come up with. There are a few things to keep in mind when designing and implementing enrichment items. 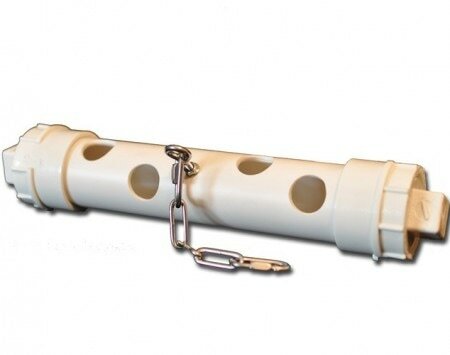 Safety should always be your number one concern when choosing enrichment items. Certain items that I use for my pigs are relatively risk-free and can be left with the pigs unsupervised while I am away at work or elsewhere. Other items may carry larger amount of risk. Some of these items can still be fantastic enrichment for the pigs, but need to be constantly supervised to ensure that the pigs’ safely is not compromised. Pigs can accidentally (or intentionally!) ingest small items and can become tangled in rope or string. Please select enrichment items carefully after fully considering all of the health and safety aspects of each item. 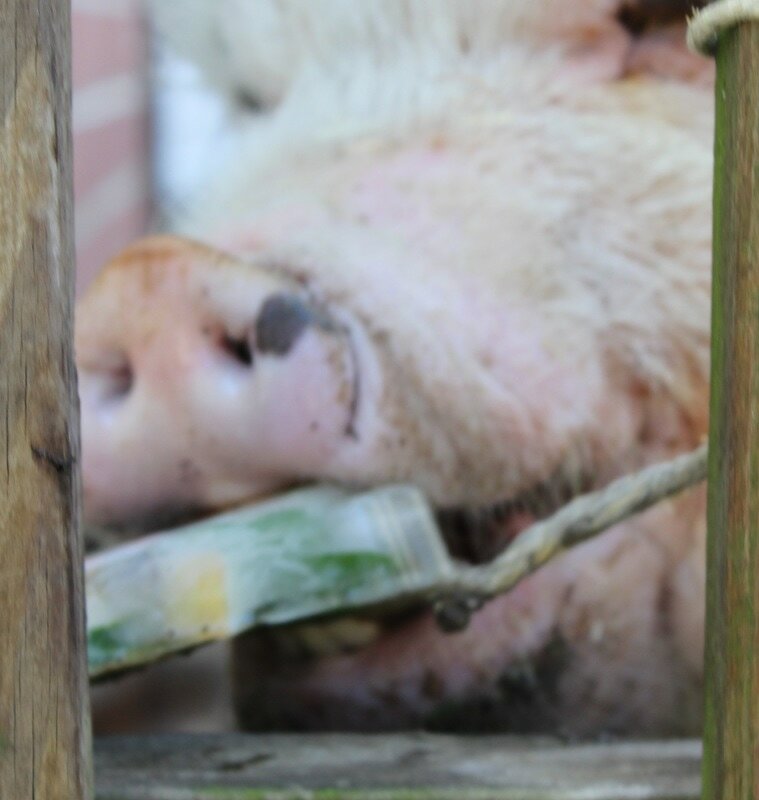 Many of the enrichment concepts used for pigs involve food items. Please be careful with selecting food items for treat dispensing toys. Be sure to only use healthy foods, and be careful not to add too much extra food to your pigs’ diet through enrichment. Remember that enrichment does NOT have to be complex! Some of the easiest enrichment items are also some of my pigs’ favorites. Also, don’t assume that since you have one type of toy that your pigs won’t benefit from another similar toy. I have many different versions of the treat dispensing rolling toys, and even though they all are basically the same, their size and shape are different, which provides for more variety for the pigs. I would encourage you to be creative with your enrichment program. Remember that the ultimate goal of enrichment is exactly that- enriching the lives of our porcine companions! 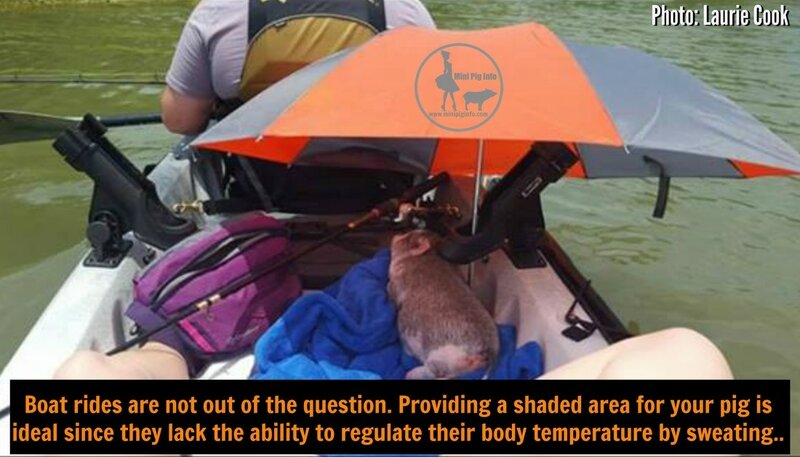 Source: Multiple online pig forums including our own group, Mini Pig Info Group. Easy DIY enrichment ideas: Also see picture examples below. Treat Balls or other treat dispensers are great for pigs. A rooting box with items that can't be swallowed with hidden "treasures" or treats such as cheerios, grapes or puffed rice cereal. A cardboard box stuffed with newspaper or shredded paper mixed in with treats. Cardboard tubes (from paper towel rolls or toilet paper rolls) secured at both ends with holes poked in the surface big enough to drop treats as your pig plays with it. Large stump to rub on or climb on top of. 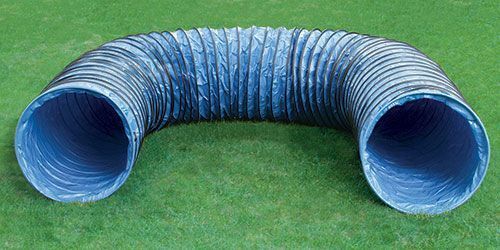 PVC piping with holes drilled in it, fill with treats, secure or cap the ends and let your pig roll it around dropping treats as they play. 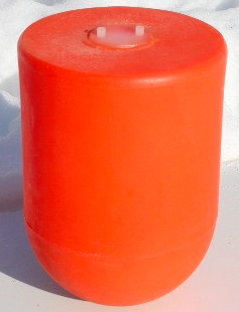 Ice blocks can be used on hot summer days. Fill a bowl with 1/2 water, freeze, add grapes or other freezable treat, add additional water and refreeze to create an ice block treat surprise. Scatter treats throughout the yard and let your pig go on a treat hunt. Phone books provide hours of shredding fun for your pig. 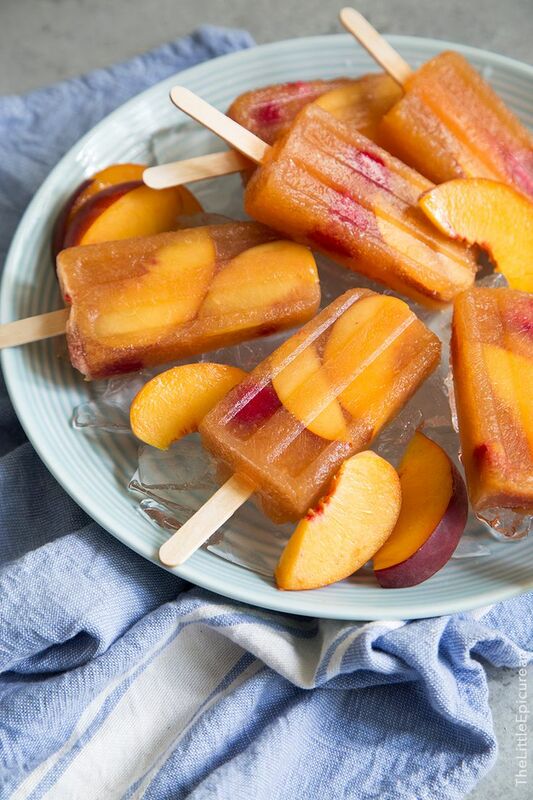 Frozen fruit in ice type treats. Yard items like pinecones with small treats like raisins hidden inside. White noise like a radio. This can be useful in several ways as diversion methods and to mask loud background noises like fireworks. 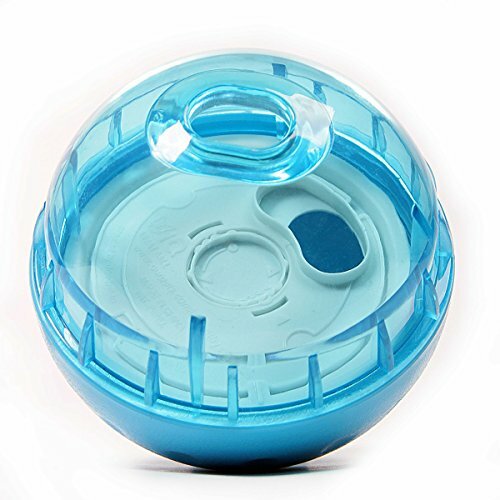 Food scatter-promotes exercise as well as enrichment. Tossing pellets outside in the yard will keep your pig busy. Bury food in the yard. Dig some swallow holes and bury small treats inside. Hanging bags or boxes that contain food. 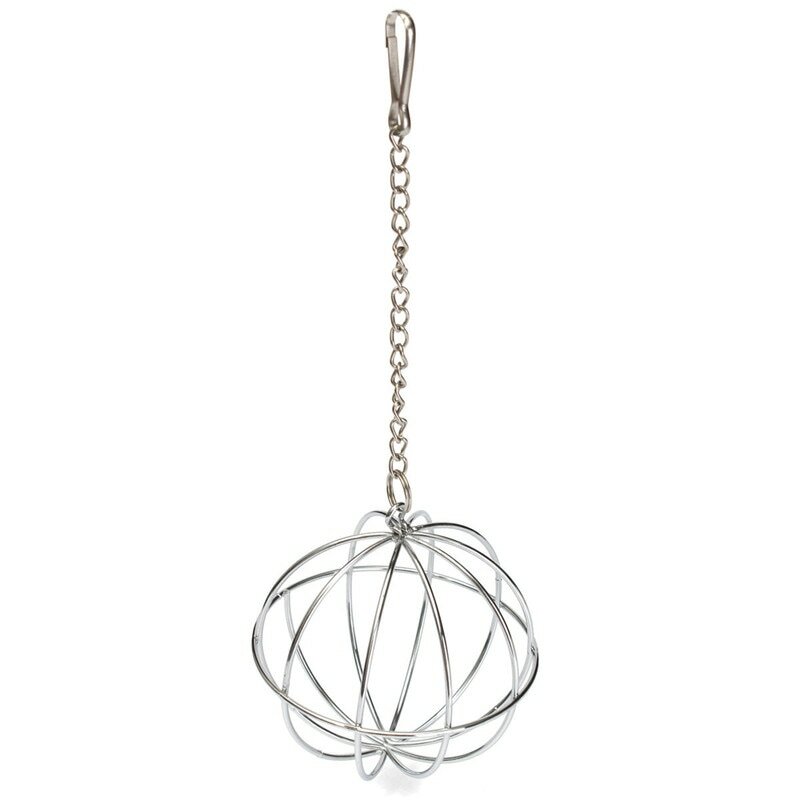 You can also hang food from rope that is suspended from a tree branch or door frame. Take your pig on a car ride. 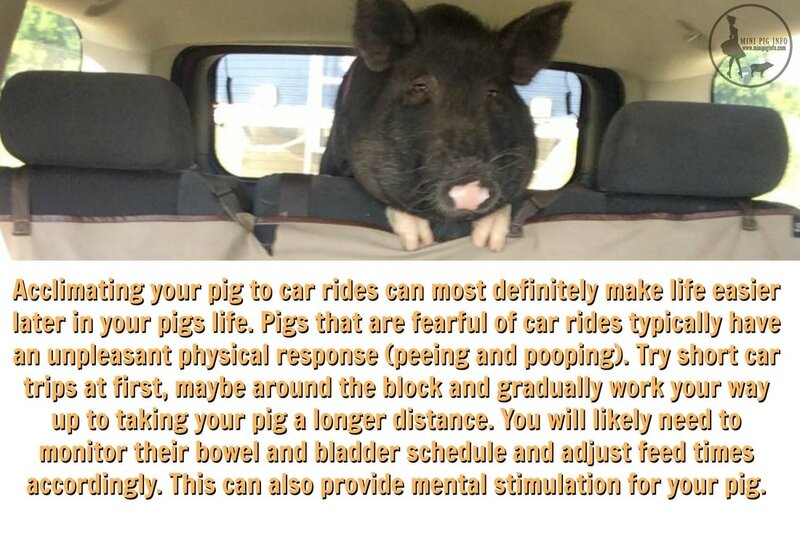 The more trips your pig takes in the car/truck/SUV, the easier it will be later on to take your pig places such as the vet or an event. Please crate train your pig to minimize any potential injuries. Large tire with treats of some kind in the rim. Go on a walk or adventure. These pigs are quite intelligent, and they will need enrichment activities to keep them from becoming destructive or bored, just like high-energy dog breeds. They need mental and physical stimulation to keep from getting lazy, overweight, or aggressive, and its important for you to interact with your pig every day! They love to perform tricks for treats, are easily litter trained, and love plenty of free time exploring a fenced in yard or pig pen, and regular walks with their owners. A potbellied pig should not be left alone with nothing to do all day or chances of destruction will most likely be the result. 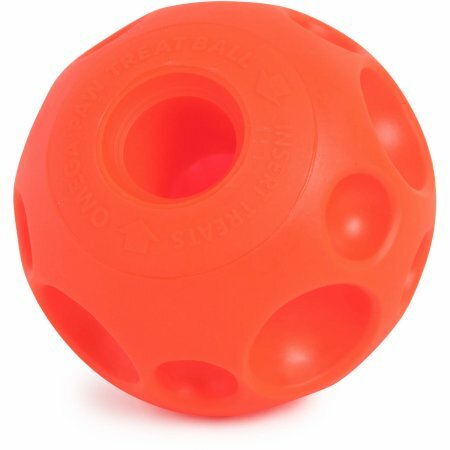 Enrichment toys like treat-stuffed Kong toys are useful tools. Especially if you plan on keeping your pig inside the house, be sure to secure or hide things that may be harmful to your pet such as chemical, cords and other items. Just because they are in a cabinet doesn’t mean that your pig can’t get to them! Pigs also require outside time, not only do they need it for stimulation purposes and the ability to fulfill their natural desire to act like a pig and root around/run, but they also need the exercise to battle obesity that is so common in pet pigs. Mobility has many purposes in any living being, but it is important that your pig have an area to run and play not only to eliminate boredom, but also to keep the body's digestive system, circulatory system, respiratory system, etc, in good working order. It has been said that humans need to walk 10,000 steps a day to maintain good health, it would be great if a pig was able to do this as well for the same reasons. A lazy pig is at risk of gaining a lot of weight and becoming obese, developing arthritis, but also having other chronic issues like constipation. There are a lot of creative ways to keep your pig occupied, above and below are examples of how to accomplish this. This is Cathy Z. 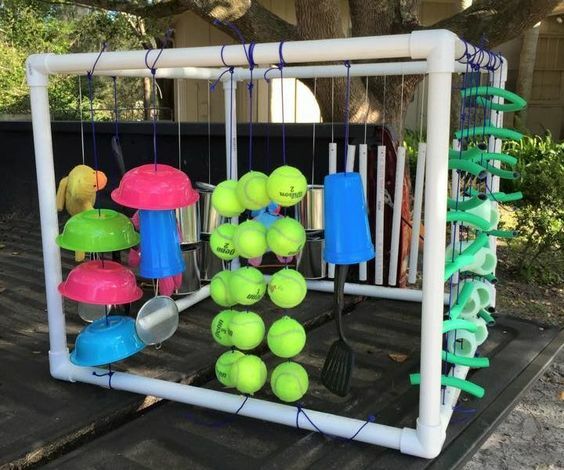 's video she shared last year (2014) of her inventive way to entertain her pigs. These are examples of enrichment ideas and basic training. 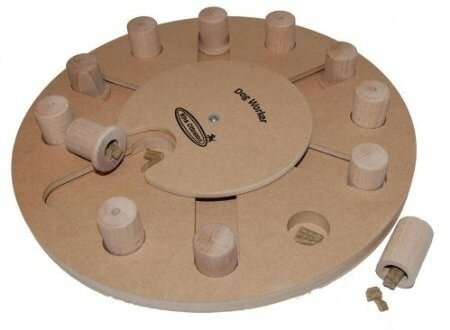 Treat dispensers, hanging toys, agility courses, etc, ALL can make pigs very happy. When choosing enrichment toys or activities, you need to ask yourself a few things before making the decision to buy it or make it. Will my pig use this? Is it worth it? Does it have good reviews? Is it appropriate for my pig? Can my pig be injured while playing/using this product? Each one of those questions (plus a lot more) will help you determine if a particular product item would be appropriate for YOUR specific pig. You may go through a lot of different items before finding one your pig truly enjoys. You may also have to rotate through toys every few months so your pig doesn't become complacent with the items you use for enrichment. I typically use the same groups of toys for a month or so before rotating them out for others and bringing them back every few months to keep my pig challenged. 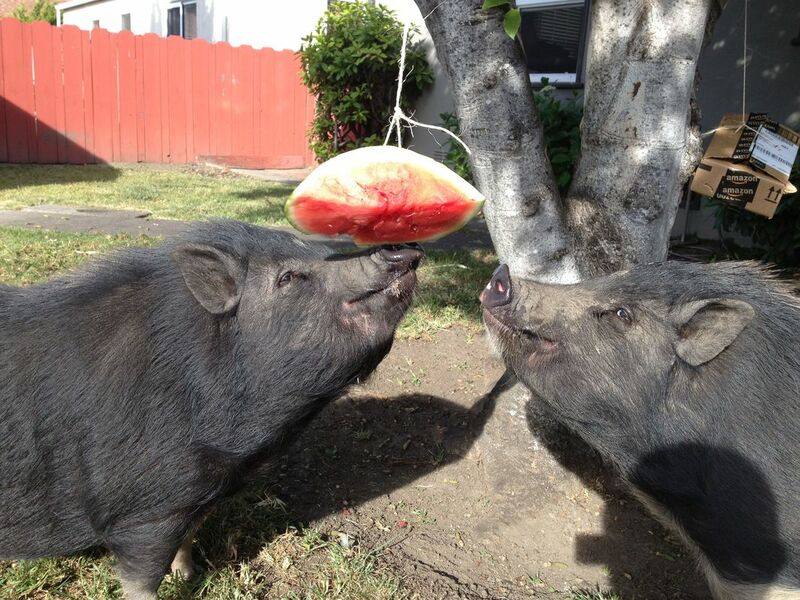 Hanging things can entertain your pig for hours! Instructions for building this can be found by clicking here. Edgar's Mission is a rescue in Australia who have a pig named Max. Max loves his new ball....until he pops it. Most balls will work though. Just be careful should that ball burst so your pig doesn't ingest any of the pieces afterwards. They should always be inspected routinely for signs of wear and tear. Bunching up the pages of an old phone book can provide hours of fun for your pig. Kong's can safely be used with pigs. Sandbox filled with ball pit balls. 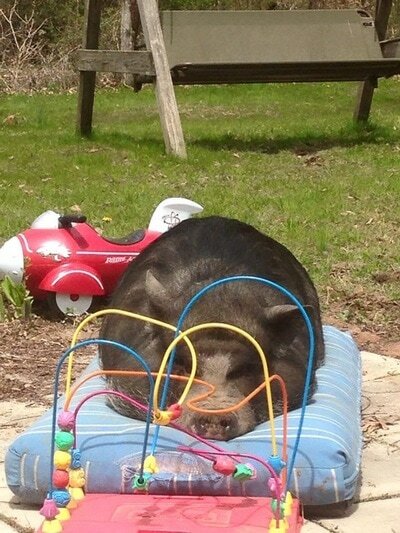 Children toys can sometimes entertain a pig. Enrichment with hay. Hanging wire. Treat dispensing DIY toy using PVC. This is called a bite ring and these are made specifically for pigs. String/rope suspended from a feeder of some kind, small pieces of wood on the end of the rope to prevent the rope from falling through to the ground. You can hang fruit or other treats from the rope. 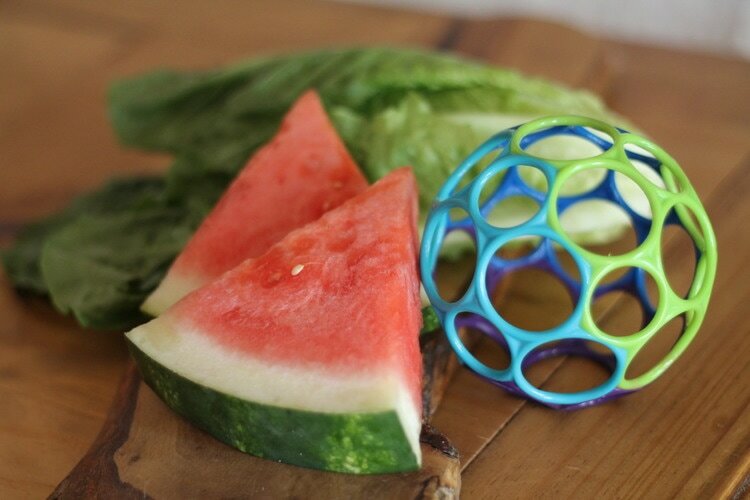 Pigs love to chew, adding hay or romaine lettuce to these can lead to hours of fun. H2O Go, < $20.00 at Walmart. Water filled cushion with built in sprinkler. These can be found in the warmer months at most home goods stores. Scratch N All pads are a favorite among animals in general, but pigs especially love them. Scratch N All pads are amazing. They aren't "just for pigs" either. Other breeds LOVE to scratch those hard to reach areas with these innovative scratching tools. They can be bought individually or sold in a pack. The owner, Cynthia, was kind enough to open an ongoing fundraiser for pigs when you use our link to purchase a 4 pack. $10.00 of every sale is donated to Mo Money For Pigs, a 5013c nonprofit organization who helps families in need when unexpected veterinary bills arise or for emergency vet care. Use this link to get the special pricing and its a win-win. You can do amazing things with fruit and water. gofeminin.de shows one way to accomplish pig appropriate "popsicles". 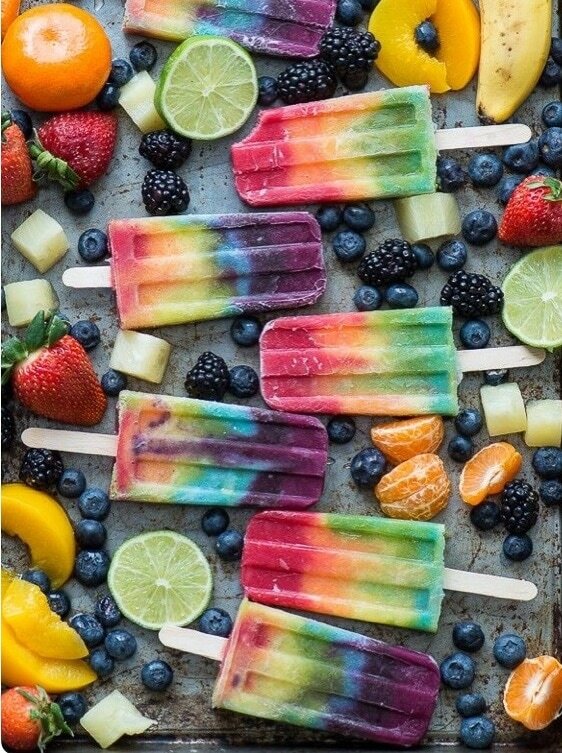 Pig popsicles made with fresh fruit and water. 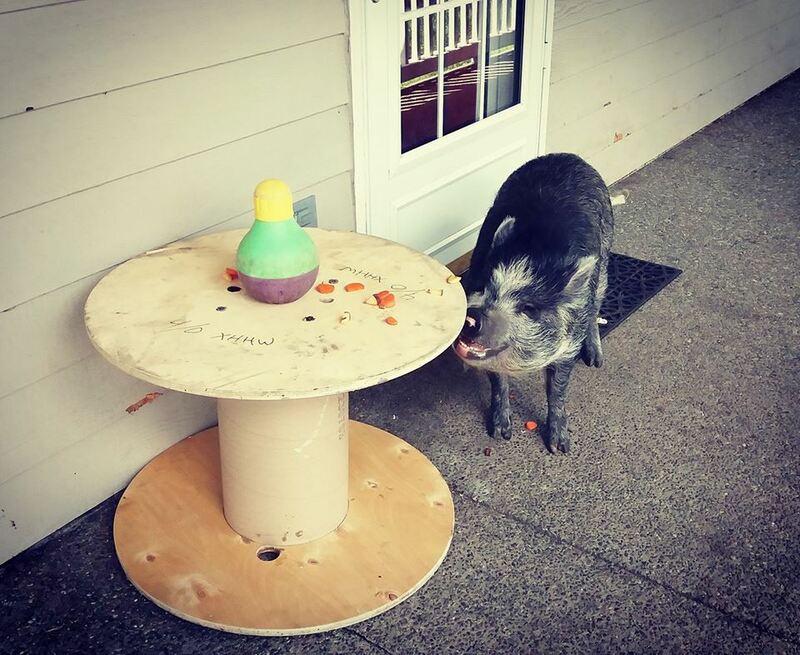 Using fruits, veggies and water along with string of some kind to hang it with can provide your pig with a nutritious snack while providing enrichment activity. Any "excess" treats, whether that be veggies or fruit (or Cheerios) and any other "treat" should be given in moderation. The general idea behind enrichment is to provide your pig with activities and prevent boredom which can result in other problems like destruction. 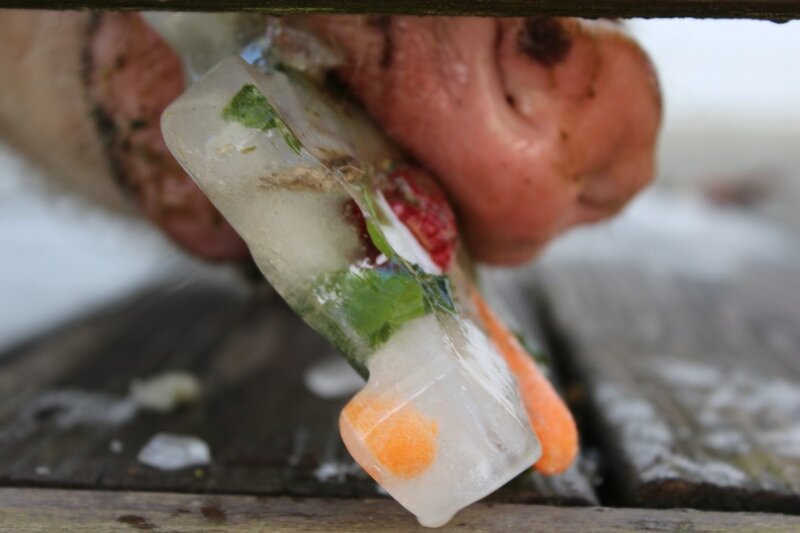 You don't have to add ANYTHING and can simply made ice blocks out of molds and give those to your pig. This can be helpful in the hotter months for several reasons. 1, if your pig is NOT a big drinker like mine, ice is essentially water, so this can provide additional hydration. 2, even ice can still be enrichment. 3, during the times you would be giving frozen treats, odds are that it is warm or hot outside, obviously a frozen treat can help cool down a hot pig. So while the general pig community is divided about giving treats as a form of enrichment, in my opinion, the benefits outweigh the risks tenfold. Especially when it isn't overdone and used appropriately. 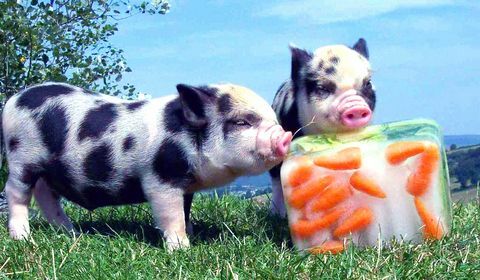 You can use fruit juice to make cubes, ONE tiny sliver of veggie or fruit to act as a reward, your treats do not have to be elaborate and you can use healthy ingredients to make sure your frozen treats are helping your pig to stay active, stay cool and also prevent boredom. These courses are not usually mastered in a couple of days. It will take some time working with your pig so that your pig knows what you're expecting of him/her. Weave leads for agility course. There are soooooo many treat dispensers and puzzles that pigs can easily master that we cannot add all the pictures here, so we will pick a few of the best ones and let you know how you can get one for your pig. Some people build their own treat dispensing enrichment items while others use a store bought toy. Neither one is better or worse than the other. Since pigs do not have the same jaw strength or ability to open their mouths as wide as a dog would, you may have to modify these toys to suit your pigs needs. If you notice constant frustration with your pig trying to get a treat from one of these, remove it and replace with something that does reward to encourage your pig to keep trying. These toys are the busy ball, the bobalot and the kong. All are known for their ability to hold treats while your pig figures out how to manipulate them to get them out. All 3 items can be purchased online at Amazon.com. The "wooden puzzles" are not usually made from hardwood like you'd expect. My pig has bitten a couple of these puzzles and even managed to scrape a piece off. Nonetheless, they are relatively safe to use for pigs and can easily be switched out every so often so your pig doesn't become bored or complacent with the same treat puzzle over and over. IQ treat dispensers seem to be a bit more challenging for pigs. You can buy one by going to Amazon. Busy Body tug a jug toy. This treat dispenser is called a pickle pocket. Can be purchased on Amazon. 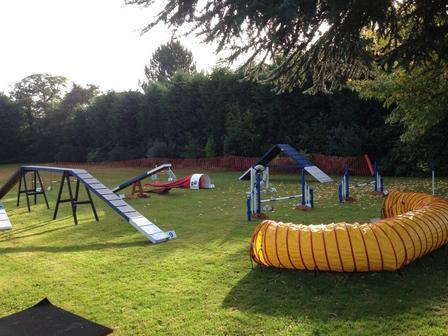 Created and manufactured by Otto Environmental, this enrichment activity has several purposes. There is a rattle in the drum which also has a plug that can be removed and filled with pig appropriate treats. Rooting boxes can help a bored pig from becoming destructive or bored. Some pigs will simply root around in the designated area and other pigs prefer there to be treats scattered around in there. It is up to you what you use to fill it with. Some use dirt, some use ball pit balls, some use rocks or sand. We KNOW there have been pigs that have gotten intestinal obstructions by swallowing rocks, so be sure whatever you use is routinely checked for parts that may fall off that can be swallowed and be sure that nothing used is small enough to be swallowed. Since pigs are so food motivated, hanging food using a rope or string is a great way to entertain them. The trick is to create a way where your pig can actually get to the food, otherwise, if it isn't possible for your pig to eat some of the "treat", that sort effigies against the whole point of "enrichment." Using pig appropriate treats, you can pretty much combine ingredients and create a hole to hang it from. 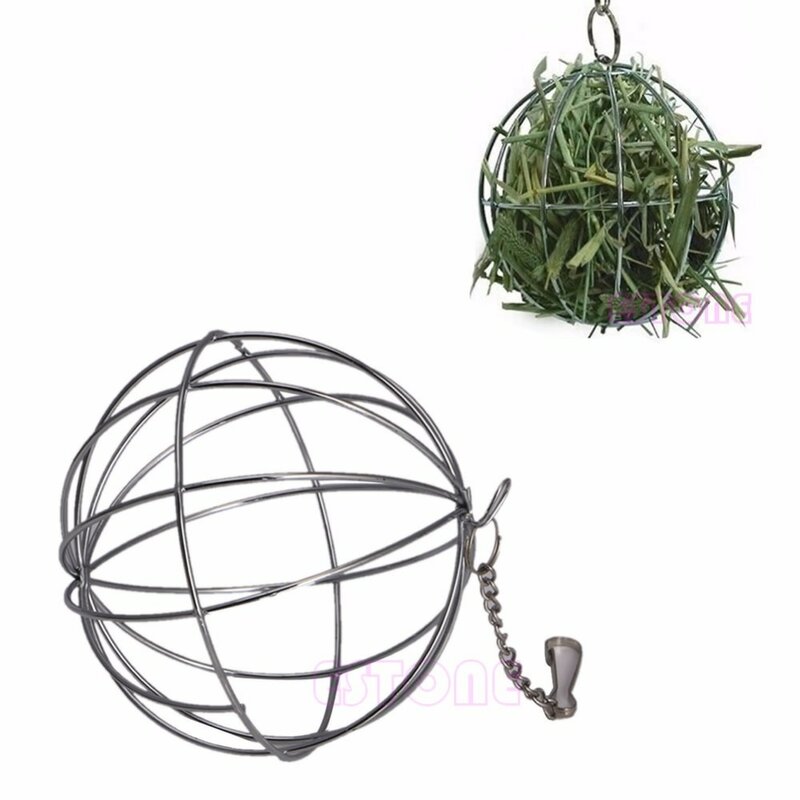 This hanging sphere is from Aliexpress.com, but anything round and sturdy that allows for hay or other pig appropriate treats to be eaten from would be great for your pig. Toilet paper rolls make good hiding spots for treats. 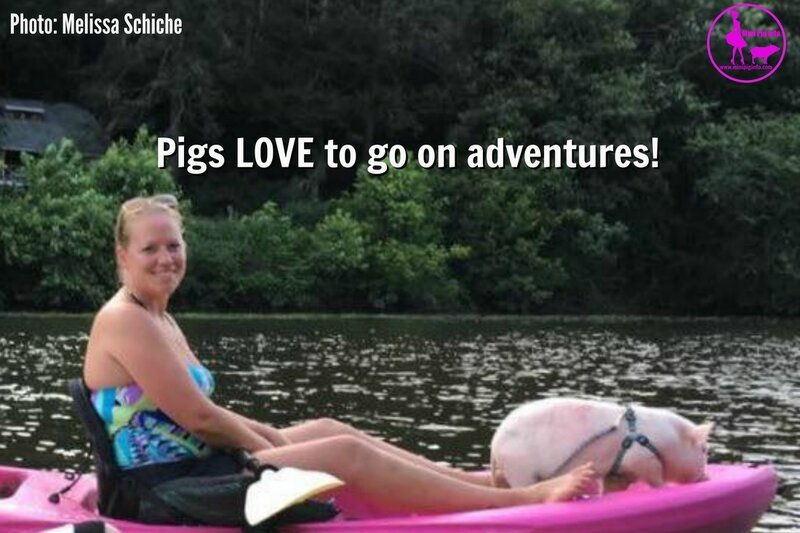 Pigs love to go on adventures. 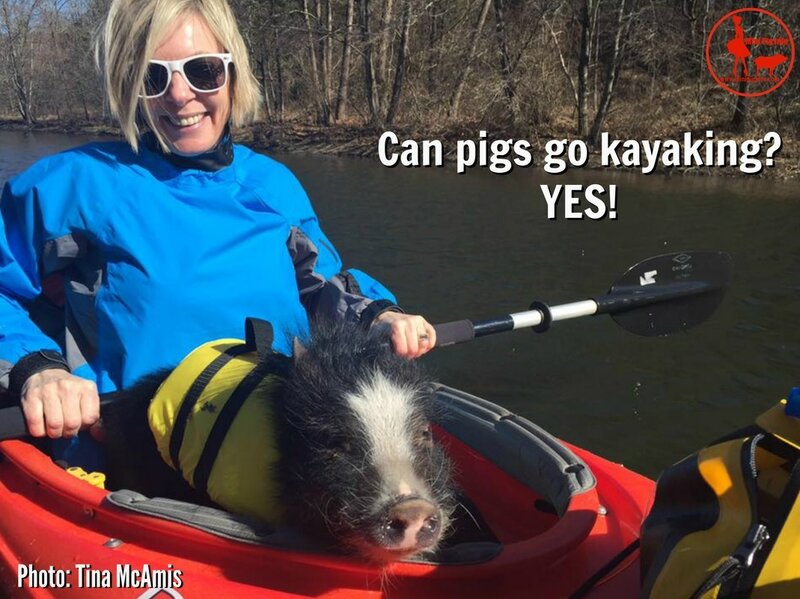 There are families who take their pigs camping, kayaking, to various stores that allow pets, etc. 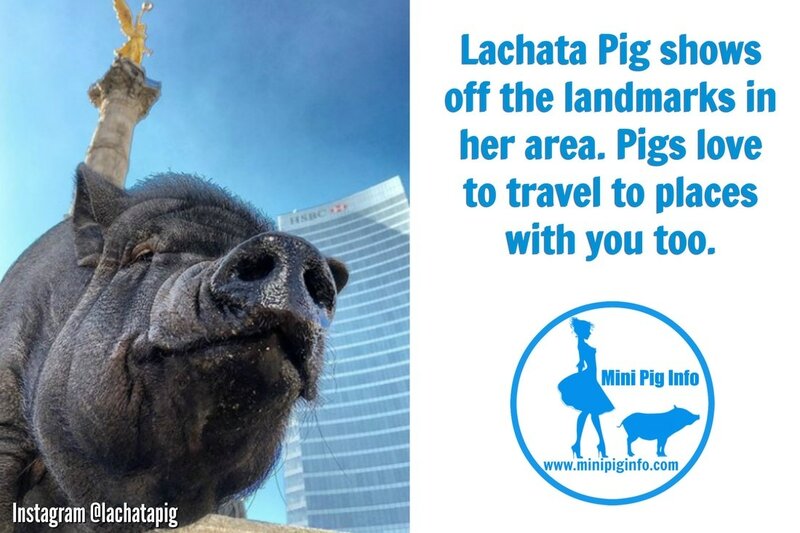 If you are traveling out of state, there are laws with regards to traveling with pigs and you can read more about that by clicking here. But, take your pig on car rides, let them go for a walk on a harness and leash. Take your pig on a bike ride or wherever else it would be appropriate to take your pig to. In this section, you will see pictures of other pig families and their pig children. Most pigs enjoy the "zoomies". Zoomies are little bursts of energy your pig may have occasionally. Older and bigger pigs also get the zoomies, but it is more common in smaller/younger pigs. Pigs will burn off this excessive energy inside or outside, so not only is this fun to watch, but also exercise for your pig! Video above is from Instagram @lilou_sfpig and Central Texas Pig Rescue. Pigs love to swim. 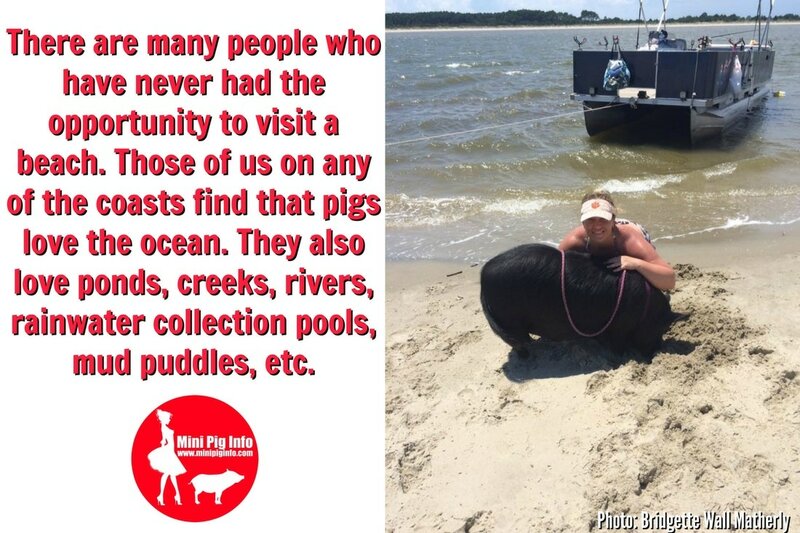 Ok, not ALL pigs love the water, but most do. Sometimes it is the set up you have that prevents your pig from feeling comfortable getting in and out of the pool. Inflatable pools can be used as well as "kiddie pools" from most discount chain stores like walmart for less than 10.00. 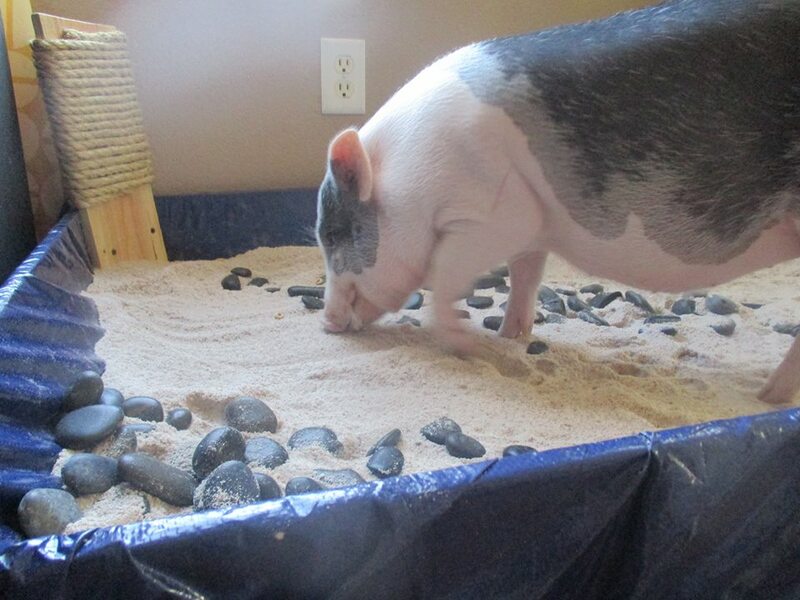 This is a great way for your pig to cool off during the hot summer months as well as provide activities for your pig by throwing in a couple grapes or Cheerios for a treasure hunt. The water doesn't only provide your pig with activities, it actually serves multiple purposes with enrichment being only one. 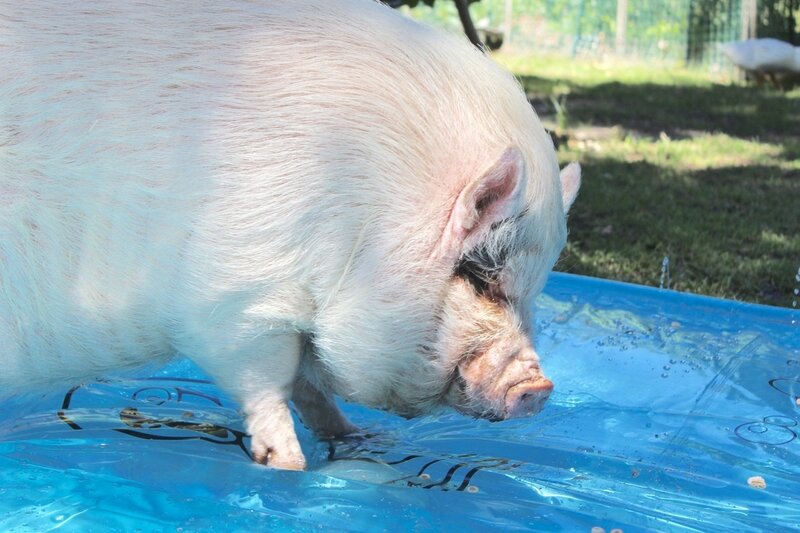 It also helps to keep them cool during the summer/hotter months of the year and because a lot of pigs are water bowl tippers, a kiddie pool is a much bigger water source that your pig likely cannot tip. 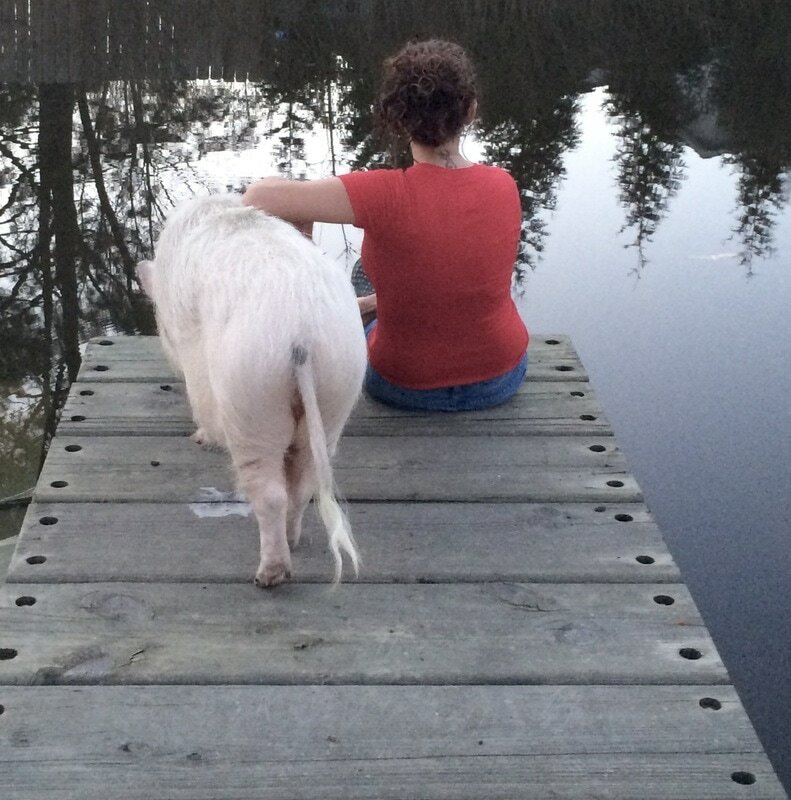 If you have fresh water lakes or streams near or at your home, your pig could take a dip in the water. 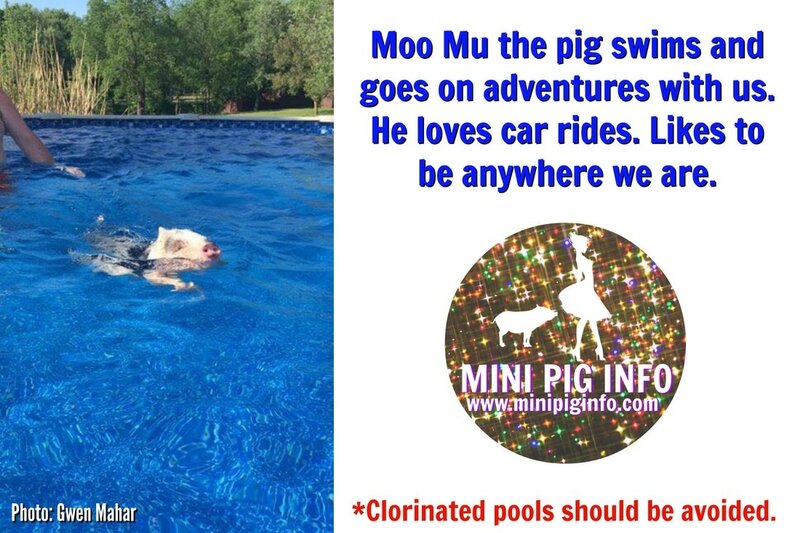 I would not allow my pig to swim away without me being present though. Photo: Tractor Supply. This is a fantastic idea. 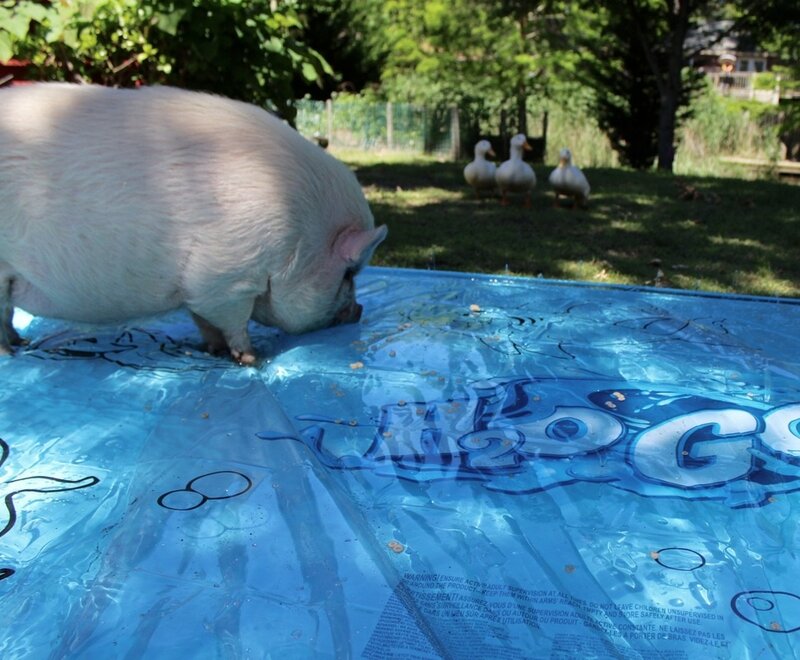 Sinking the kiddie pool helps because your pig doesn't feel off balance or have to set over the side to get in. 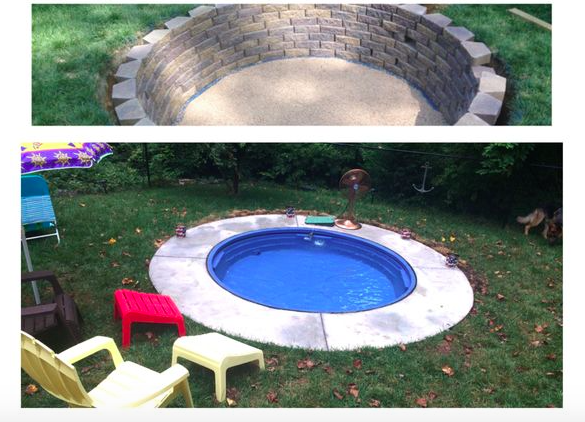 You can add a drain to these plastic pools so they can easily be drained and refilled after cleaning. 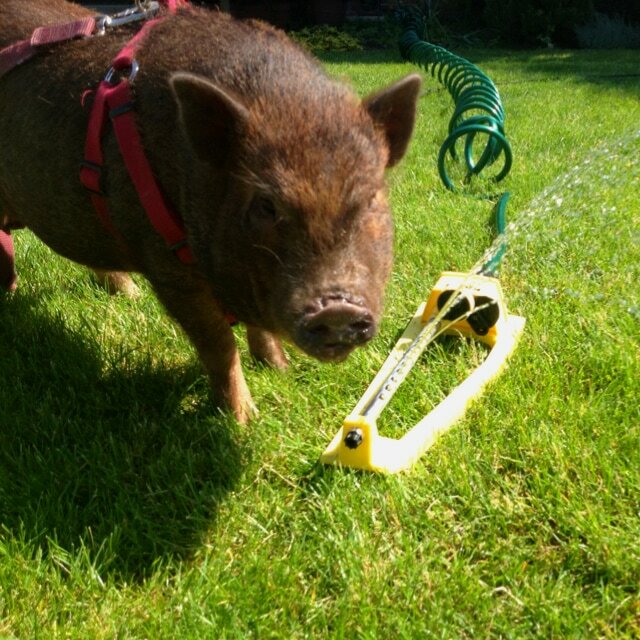 Pam Goldbach's pig Dewey loves the sprinkler. This sweet piglet is having a super good time zooming around in the water. I started painting with my pig a couple of years ago and donating the paintings to various charities to be auctioned off. I have learned a couple of things in doing this, 1st, painting is SUPER messy. 2nd, people love pig snout paintings. 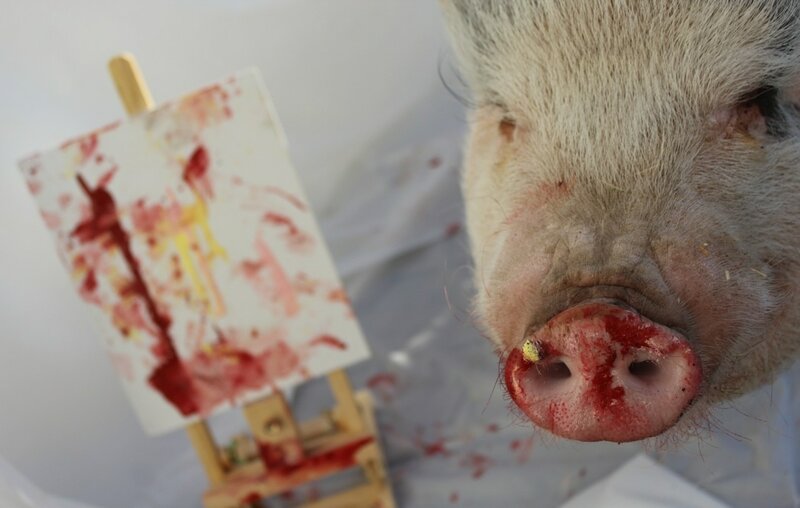 3rd, pigs actually seem to enjoy painting. 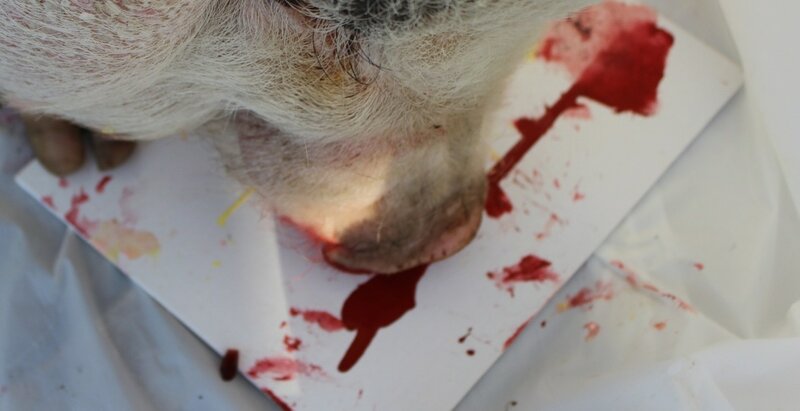 I know several others whose pigs are now painting pictures and I have yet to hear of a negative outcome! (Make sure you are using water based NON-TOXIC paints) Flat canvas boards are the easiest to use, in my opinion. This picture was painted while I was fostering a pig that was formerly aggressive. Ziggy has his "own" way of painting. Still cute though! Less messy ways to do it is to spread paint on a canvas and put saran wrap on top and spread some treats over the surface to create your own- one-of-a-kind, piece of art.